We were having drinks at Burton's in Nashua and stroke up conversation with an older couple sitting next to us at the bar. After we told them we were from "LA" (Lowell Area), they told us about a small cafe they frequent nearby in Chelmsford, where they look forward to the "fried dough with dipping sauces." I was intrigued but this mysterious place and Googled it. The couple was referring to the bakery formerly known as Sugar Bake Shoppe and the fried goodness they were describing was the French beignets which was the shop's Saturday Special. Instead of our usual Asian brunch at Heng Lay or Simply Khmer, we headed into Chelmsford to check out the cafe. 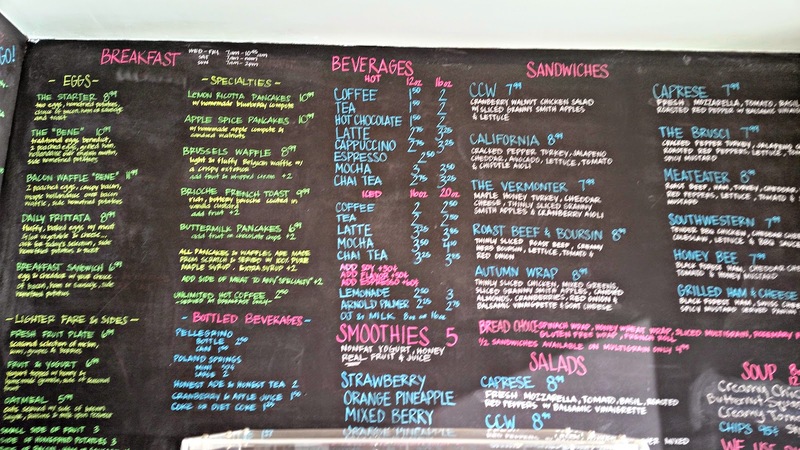 The cafe is located right off the Bruce Freeman bike trail in Chelmsford Center. There was plenty of parking on the side and the rear of the building. We arrived a little before 10 AM and there was a couple finishing up their meal. 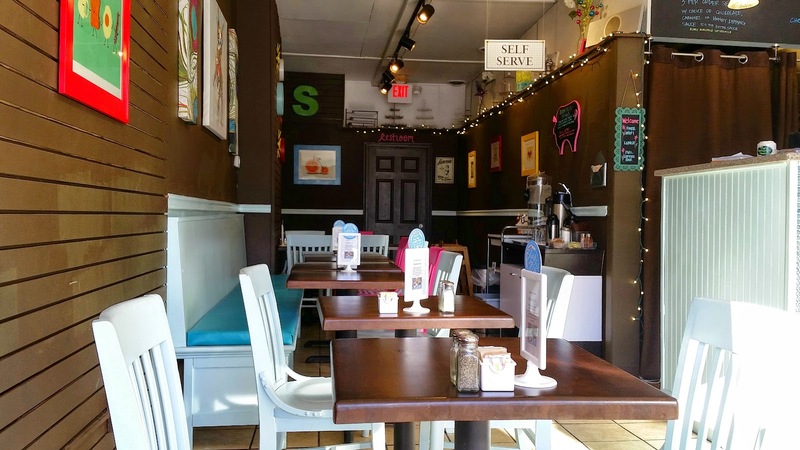 The breakfast and lunch menu was written in chalk on the black board but of course I already knew what I wanted from stalking their new website, their Facebook and their Yelp page. 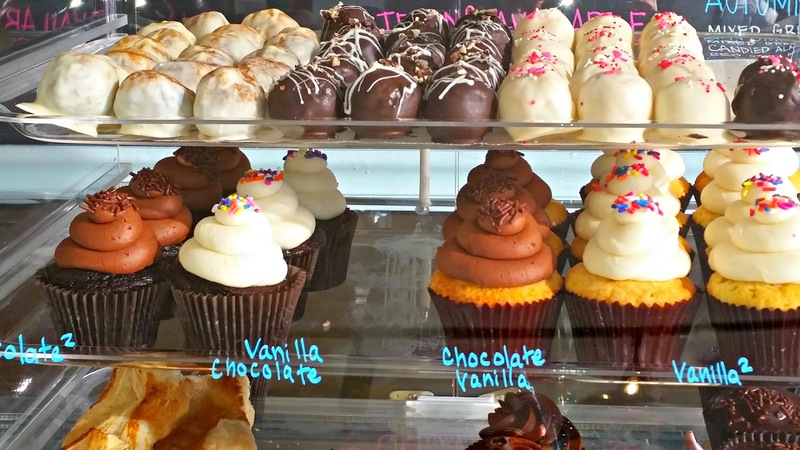 There was a display case with cupcakes, brownies, macaroons and other assorted pastries. We were sold and got a few desserts to go. We placed and paid for our order at the counter and found a table. The restaurant has just cleared out so we had it all to ourselves. The cafe is kinda set up like a self serve where you can grab your own condiments and tap water. You also return the dishes to the bin, Panera style. The food took less than 5 minutes from the time we ordered until it was brought to our table. We split a few different things. All the dishes were beautifully presented with fruit garnishes on an aqua dish. I felt like I was at a cool brunch eatery in the city! 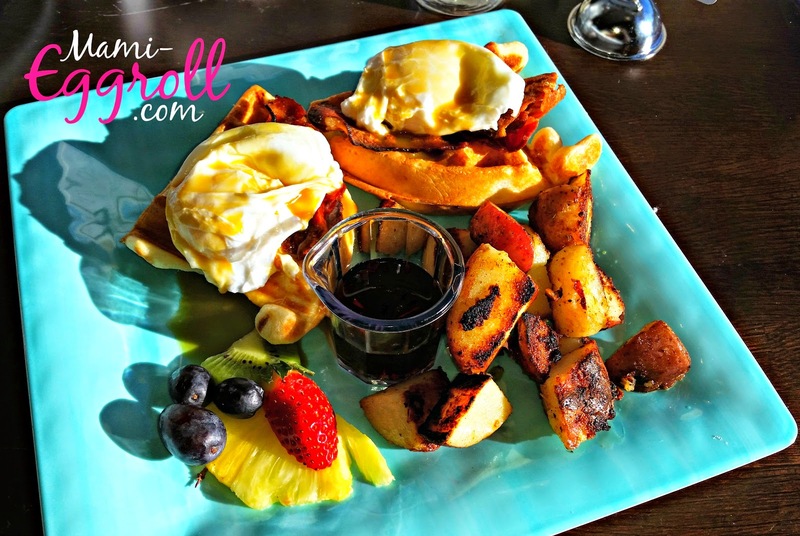 The first dish was the Bacon Waffle "Bene" which had 2 poached eggs, bacon and maple hollandaise sauce over a bacon Belgian waffle. The dish was served with home fries. Although I had to request an extra side of hollandaise sauce, the dish was amazing! Usually I have my waffles with sweet topping like I do at Chip's but the salty contrast from the bacon was a nice change. The home fries were made with white and red skin potatoes and had a perfect crisp from the pan sear. 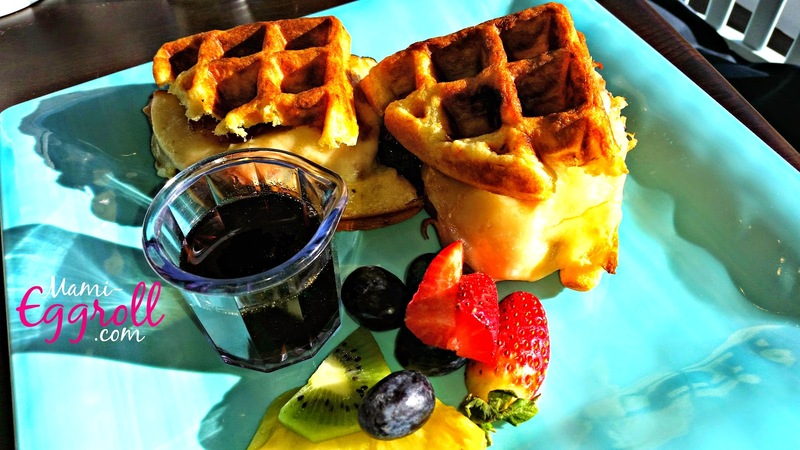 The waffle monte cristo was not on their regular breakfast menu but I made a special request for it since I saw it previously posted on ther FB page as a special. They were able to accommodate our request. The waffle "bread" held together the Dietz and Watson ham and gooey cheese and was served with maple syrup. The dish had a nice sweet and salty contrast. Of course we had to get the beignets! 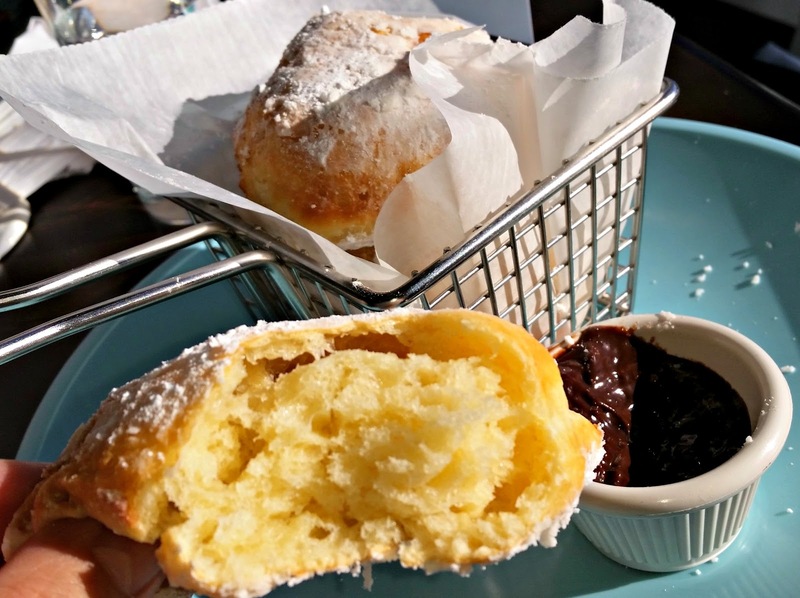 Beginets are delicious deep fried French pastries usually served with powered sugar. It's a breakfast staple in New Orleans. Each order came with 3 large pieces and was served with your choice of dipping sauce. Chocolate, honey and caramel was available when we visited. If you wanted to try more than once sauce, you could do so for an extra .50 cents. 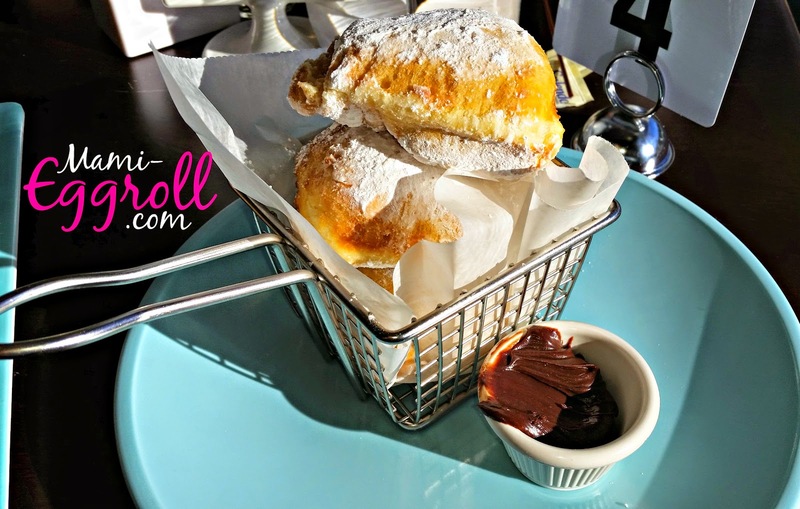 The beignets were indeed piping hot when brought to our table in a cute fryer basket display. They were such a guilty pleasure. The dough was soft as I pulled it apart with my fingers. The powder made a mess on the plates and my shirt but I didn't care. I was in heaven. We loved everything we ordered. I admit the meal was a bit on the heavier side. If you are looking for lighter options, they do offer fruit plates, yogurt parfaits, oatmeal, poached eggs etc. We will definitely be back. I felt that the prices were very reasonable and the quality of food and service was great.